The Sacred Page: Have the remains of first-century Jews killed in the war that destroyed the temple been found? Have the remains of first-century Jews killed in the war that destroyed the temple been found? 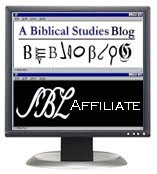 A number of bloggers (Jim West, Antoni Lombatti; David Meadows) have been writing on a potentially huge discovery made in Israel. Apparently, skeletons of Jews massacred in the war that destroyed the temple in A.D. 70 may have been found in Jerusalem. Stress should be placed on the may there. Tests still need to be performed to confirm that the bones found can be dated back to the first century. Nonetheless, that they are actually the remains of those who died in the war seems plausible. Of course, the destruction of the temple marked a major moment in history--and had huge theological implications. For one thing, Jesus predicts the destruction of the temple in the Gospels (cf. Mark 13:1-2). 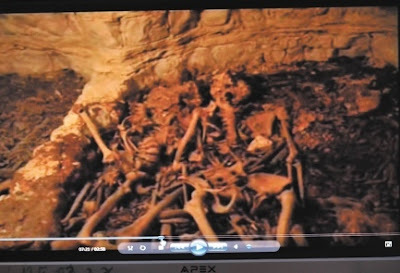 Veteran journalist Benny Liss releases movie he filmed of underground cave on Temple Mount where he found a mass grave He believes the skeletons are the remains of Jews massacred by the Romans when they destroyed the Temple Mount, but urges the authorities to properly examine the area. Remains of thousands of Jews massacred by the Romans on the Temple Mount at the time of the destruction of the Second Temple may have been uncovered in Jerusalem, according to a veteran archaeological journalist. Liss, veteran archaeological correspondent for Israel's Channel 1, told the amazed audience that the film had been shot in a spacious, underground cavern in the area of the Mercy Gate, near the eastern wall of the Temple Mount, but just outside it. Liss raised the possibility that the skeletons were the remains of 6,000 Jews, mostly women and children, killed on the Temple Mount when the Romans destroyed the Second Temple, as described in the writings of Flavius Josephus, who witnessed the destruction. The movie shows a group of people accessing the cavern with construction tools. Liss goes in first, followed by a lighting technician and cameraman. The three first pass through a narrow passage and then enter the cave with the skeletal remains. Liss says he tried to work out the size of the pile of remains by putting his hand in as far as he could, but he could not reach the bottom. The movie shows Liss crumbling some of the carbonized materials near the skeletons. As soon as Liss left the cave, Antiquities Authority staff resealed the cave, he says. During the lecture, Liss also cites historical sources that show that in the area of the Old City where the Muslim cemetery now stands, there was once a Jewish neighborhood and cemetery, which was moved to the Valley of Josaphat. He basis his theory that the skeletons are the remains of the people killed on the Temple Mount on the site of the mass grave, the soot in the cave and the written history. "The Romans stayed on the Temple Mount for a month after the destruction of the temple until going on to conquer the upper city [today's Jewish Quarter],” says Liss. “They had to get rid of the thousands of decomposing bodies and the most obvious place to do this would have been the natural caves on the upper slope of the mount, around Mercy Gate." The veteran journalist emphasized that this was just a theory. "Now, after publishing this information, the experts should go into the field and examine what we found back then, evaluate it and publish their own findings," he says. Liss does not believe that the remains are Christian since on the lower levels of the mount he has documented systematic Christian burials where crosses, sandals and buckles clearly attest to the religion of the dead. The same cannot be said about the burial site closer to the Mercy Gate. Asked why he waited until now to release his findings, Liss said that he was worried that they would ignite the situation and wanted to wait for a better time. A host of senior archaeologists approached by Israel Hayom said that photographs were not enough to determine the history of the cave and that samples need to be taken from the site and dated. Professor Dan Bahat, a former Jerusalem District archaeologist, said the bones could be Jewish, but also just as easily be Christian or Muslim. Prominent archaeologist Dr. Gabriel Barkai said that Muslim mass graves had been found in the area in the past, though he does not discount other possibilities. Archaeologist Dr. Ayelet Mazar said that such a finding was unprecedented, but refused to come to any conclusions without further investigations being carried out. The chances of the site being reopened are very slim as it is located in a particularly sensitive area, where the Jerusalem Islamic Waqf keeps a close watch and interprets every movement by Jews or Israeli authorities on the mount. The Antiquities Authority said in response that it was unaware of the findings presented in Liss' movie, and it would be happy to receive the materials. One official told Israel Hayom that he was aware of unsubstantiated reports of a cave with a large amount of human remains in the area, but because of the extreme sensitivity of the location and its close proximity to the Muslim cemetery, the cave had never been explored. Perhaps this discovery at this juncture in history is a sign from God for all of us to reflect on deeply and, dare I say it, draw historical parallels with the present moment.